Look. Arrow may be in a bit of a slump, The Flash may have made a few questionable decisions, and maybe Legends of Tomorrow was a little goofy for your taste. 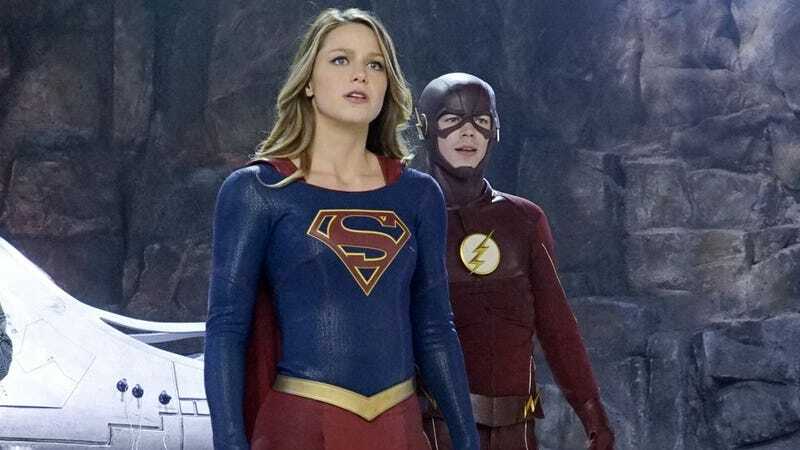 But it’s worth taking a moment to remember that these DC superhero shows—along with Supergirl—are giving us some of TV’s most absurdly awesome moments. Case in point! We have three VFX highlight reels from The Flash, Legends of Tomorrow, and Supergirl, courtesy of Deluxe’s Encore VFX and supervisor Armen Kevorkian (who spoke about the difficulty of making three epic superhero shows at once here). This first one highlights the return of oversized evil telepathic gorilla and noted Flash foe Gorilla Grodd. This second season episode is also notable for including a scene where the aforementioned oversized evil telepathic gorilla was punched into a different universe. The Legends of Tomorrow reel is all about the team’s fight against the giant honking robot Vandal Savage uses to maintain control of the world. A spaceship fought a giant translucent robot, and then the giant translucent robot fought a giant Brandon Routh. Not in a major motion picture—on TV. At 8:00pm. Thursday. On the CW. And last but not least, here’s Supergirl’s reel, which includes the plane she saved in the very first episode, which revealed her powers to the world. It might not be necessarily as obviously unique as Evil Giant Telepathic Gorillas of Giant Robots Who Are Programmed by Evil Immortals, but Supergirl’s truest power is being the most heartwarming show on TV, and that’s a special effect in and of itself. I’m not saying Agents of SHIELD or Marvel’s Netflix shows are bad, mind you. But they are trying to be somewhat sensible and grounded, even when they involve evil magic ninjas. But these DCW shows just go for it, man. They embrace their comic book-iness and celebrate it. And as a result, these shows are often much, much more fun than their Marvel counterparts, even while you’re wondering why Barry Allen keeps refusing to learn anything about the consequences of time travel.